Departing Sarajevo early in the morning, we enter Montenegro and begin driving on the road toward Durmitor National Park, our destination for the next four days. Passing through 66 tunnels blasted out of limestone, we travel beside Lake Pivsko, an other-worldly sapphire. Our first hike in the Unesco World Heritage site of Durmitor Park is around Black Lake, obviously a popular place. It seems like there are more people in this part of the park than we saw in all of Bosnia! Very different indeed. Our second hike, to Savin Kuk (7,586 feet), is steep and full of scree. It takes five hours, and frankly, it is hard work and does not offer the beauty, the wild flowers, the variety of topography that Bosnia offers. Still, the view is panoramic, the weather perfect. 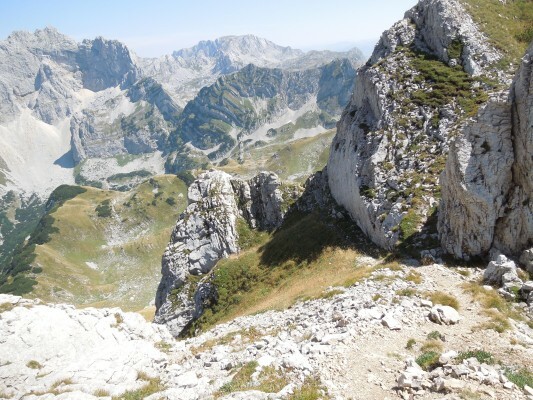 Our third hike to Prutas Peak and back is six hours across great rolling green and yellow hills punctuated by huge limestone massifs. The trail is treeless, entirely exposed. There are few other hikers and the only sounds we hear are humming insects and the whispering wind. In some spots, the path is only about ten inches wide; in others, rock scrambling is required and the drop-offs appear to be straight down thousands of feet on either side. These test my tolerance for fear of falling, but I grit my teeth and soldier on! 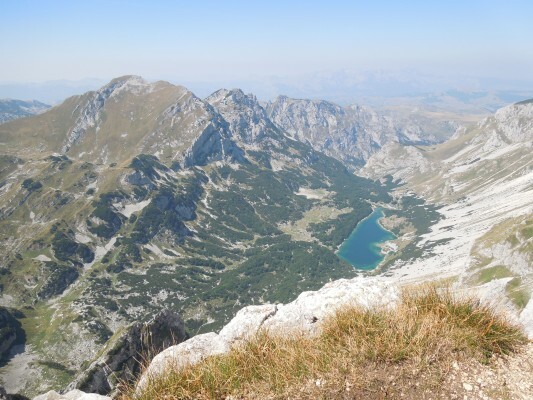 From the summit (7,851 feet), we have a 360-degree view including Mount Maglic in Bosnia (our hike three days earlier), Savin Kuk Peak (the previous day’s destination), and Bobotov Kuk (the upcoming hike). 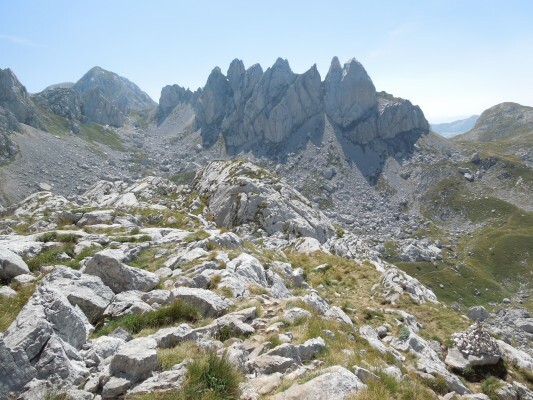 Our fourth and final hike is to the aforementioned Bobotov Peak (8,277 feet), the highest mountain in Montenegro. 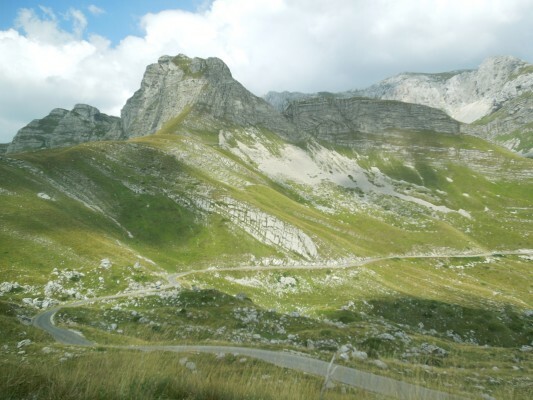 The climb takes seven and a half hours. The day is perfect, the hike arduous. Like several of the others, it is characterized by long, steep ascents and descents of scree as well as rock scrambling. This one has the scariest exposure yet, which requires me to face the rock wall as I try to find the safest footing on tiny rock ledges and avoid looking at the tremendous amount of air space between myself and the ground far below. The view at the top is breathtaking and makes the treacherous trip worthwhile! It’s a very good thing our hikes are done, because my feet want nothing to do with hiking boots. For our last adventure, we go rafting on the Tara River. 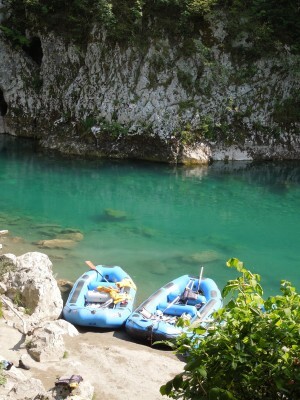 The rafts go in the water in Montenegro and we ford the rapids for twenty kilometers down the river back into Bosnia. The water is so clean that one can drink straight from it! It is so clear, that one can see many meters down to the bottom. 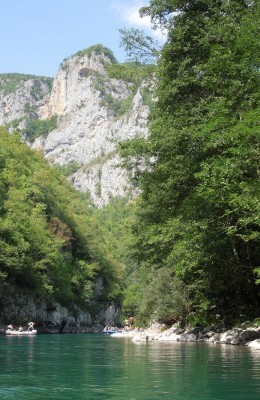 The depth of the canyon in which the Tara runs is 1,300 meters from the top of the mountains that line its sides to the water level. It is a glorious day and such a lovely change from what has gone before. And so now on to Santorini.